n the sports-event industry, one successful event can often lead to another. And that maxim held true February 7–9 when one of the country’s most historic sports venues staged yet another of the most modern and unusual sports events in the world. 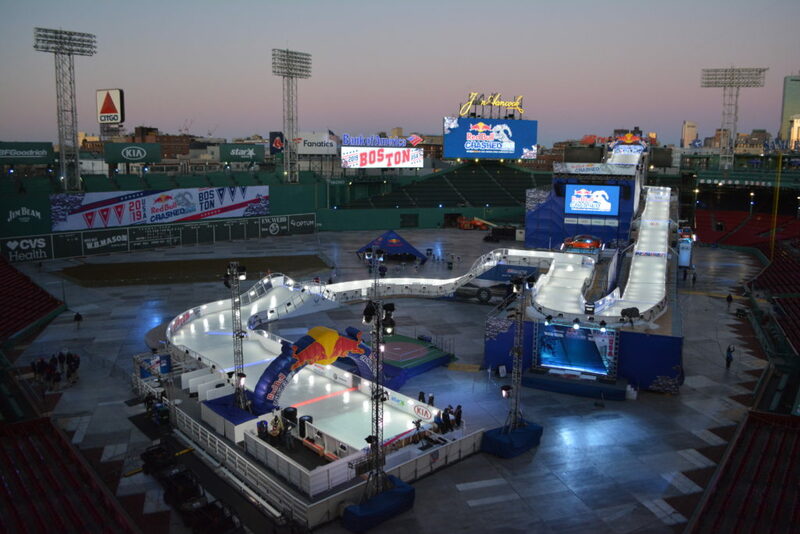 How the spectacle of Red Bull Crashed Ice came to Fenway Park is a testimony to a sports-event organizer’s willingness to push the boundaries of a live competition and a venue’s willingness to take a risk with new types of events. 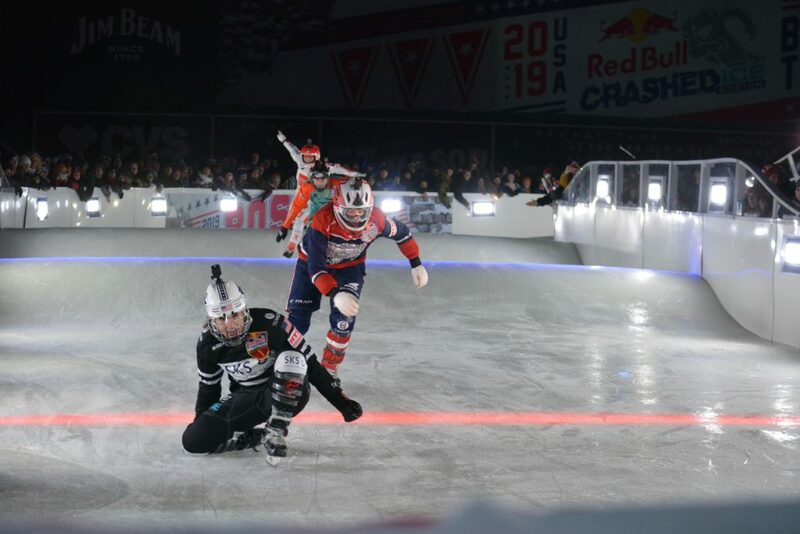 For the uninitiated, Red Bull Crashed Ice is an event in ice cross, a sport similar in concept to the Olympic disciplines of snowboard cross or ski cross. In each of those formats, four people zip down a winding track to be the first ones across the finish line, with the top two finishers in each heat advancing to subsequent rounds. In the final heat, the first person across the finish line is the champion. But instead of competing on a snow-covered course on snowboards or skis, heavily padded ice cross athletes compete on hockey skates down a winding sheet of ice not unlike a bobsled or luge track. With cliff-like jumps, rolling bumps and hairpin turns along the way, the sport lends itself to crashes and falls in tight races, not to mention dramatic conclusions in the final stretches as skaters lunge to the finish line. 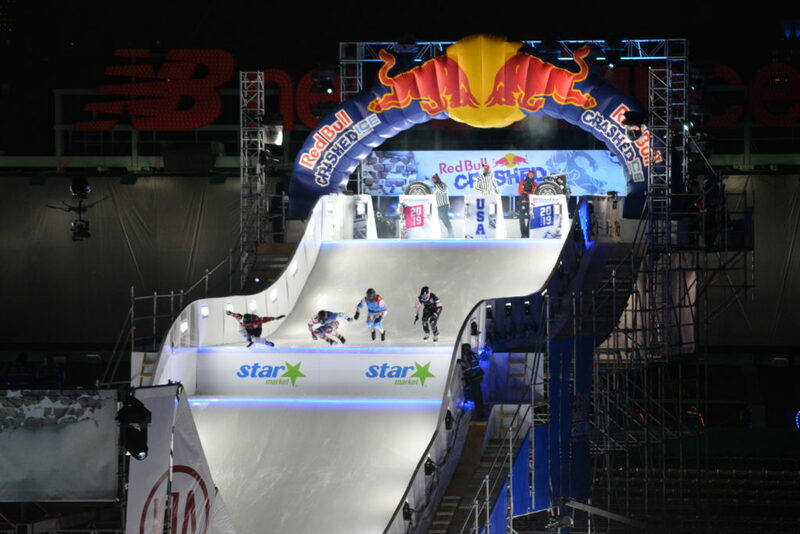 An international federation—All Terrain Skate Cross, or ATSX—oversees the sport and recognizes the Red Bull Crashed Ice events as its highest, or 1,000-level, competition. Several other smaller events are staged worldwide as well during the season at the 500- and 250-level, with athletes gaining points toward a world championship title depending on their finish and the level of event. Because of the considerable work involved in building the course for those showcase events, Red Bull is limited to staging three to four events each season. 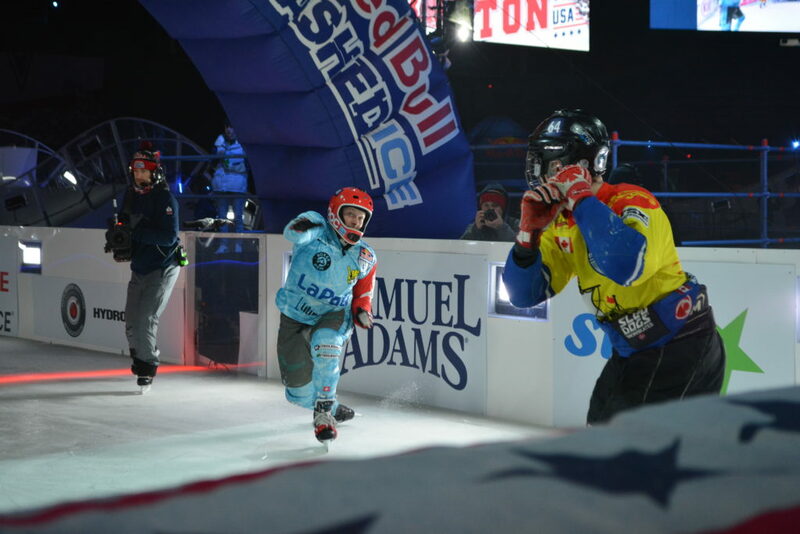 For the past seven years, St. Paul, Minnesota, has served as the Crashed Ice tour’s U.S. location, with a course built outside the Cathedral of St. Paul. Quebec City has also hosted a North American stop several times in recent years, with a dramatic course through the city’s buildings and streets. But this season has marked a shift in strategy for Red Bull. 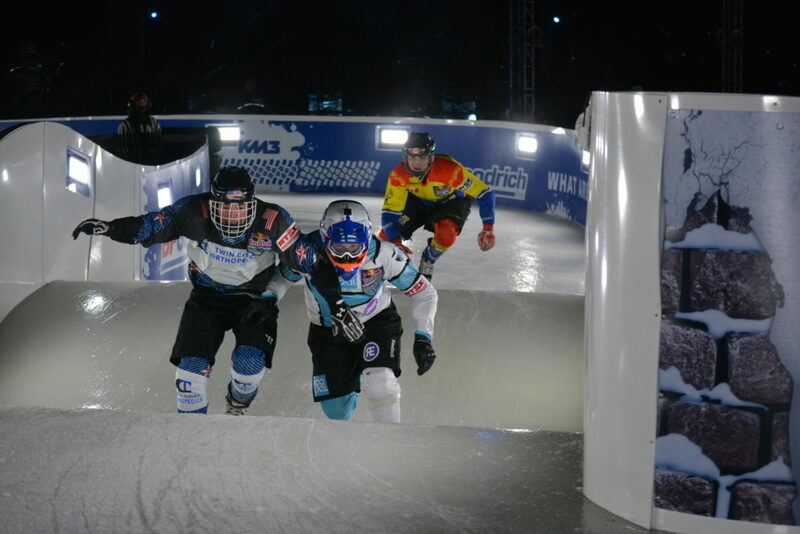 The opening event was staged in December on a course built in Yokohama, Japan, the first time Crashed Ice has visited Asia. The second stop was on natural ice in Jyvaskyla, Finland. But Fenway Park marked perhaps the biggest shift of all: The first time in the event’s 18 years that it has been held in an enclosed stadium. It also marked the first time the tour had come to the East Coast. Finishes in each heat often lead to dramatic conclusions as the first two skaters advance to the next round. Among other things, the move to a stadium allowed Red Bull and Fenway Sports Management to sell tickets where spectators could view the entire course at once—a rarity in locations like St. Paul or Quebec City where fans could only see the portion of the track near where they were standing. Organizers hoped to sell about 20,000 tickets combined over the event’s two nights. But how did the event come to Fenway? That’s where the old notion about past events paying dividends comes into play. Fenway Sports Management was attracted to the exciting nature of the sport and its athletes. More than 9,000 square feet of scaffolding were required to build the course. While fans could buy tickets to be on the field and near the track, the majority were in the ballpark’s upper seats watching the action with a bird’s eye view. That may have taken away from some of the authentic connection the sport can have with spectators banging their hands along the boards, but from a logistics end, it also eliminated a number of headaches. 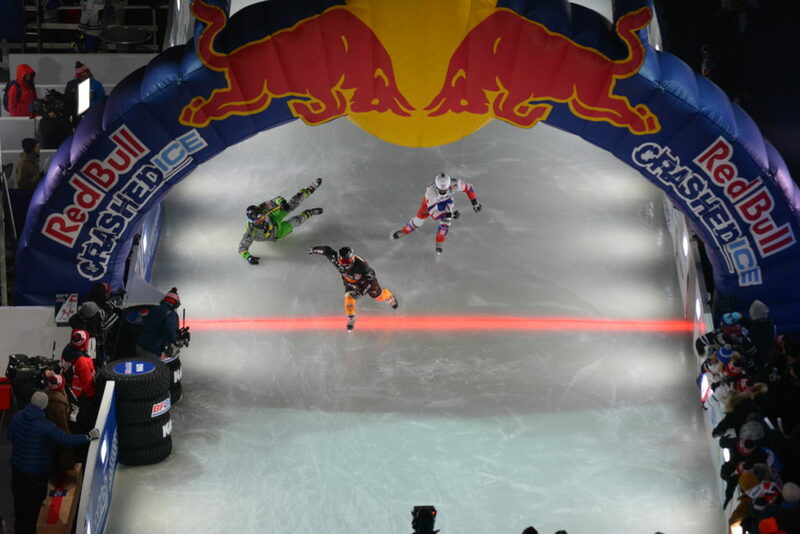 Papillon said Red Bull would like to be in relatively warmer environments with Crashed Ice, although Florida, for example, would be too warm because of the logistics of outdoor ice making. Another big concern is too much sun, which can wreak havoc with the course even in colder environments. The tour has gone indoors only once, but could also conceivably stage events in an arena, he said. Spectators could buy tickets to be on the field next to the course or up in the stands to get a bird’s eye view of the action. The Fenway show proved the event can go to stadiums, but it’s not clear Red Bull is ready to move all its events to that format. Papillon didn’t rule out a return to the cities the tour has visited in the past, but certainly suggested the future may be in pushing the boundaries, which has become something of a Red Bull hallmark. He also noted that moving the event exposes the sport to new athletes. Asian athletes have been moving up the ranks for the first time, something he attributed in part to the new exposure on the continent from the event. 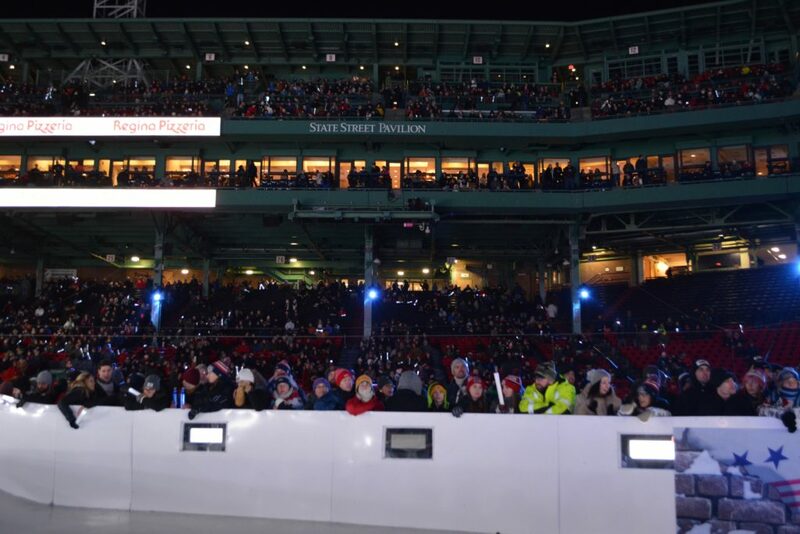 Ice cross athletes had some fun with the baseball stadium environment, with several trying to hit imaginary home runs over Fenway’s famed Green Monster after their runs. Olsen said Fenway is also seeking to do more warm-weather events around the 81 regular-season Boston Red Sox games hosted every year, identifying soccer and rugby specifically of interest. Reigning women’s world champion Amanda Trunzo (left) would like to see ice cross contested in other ballparks in the future.